Copenhagen-based singer/songwriter Katrine Ottosen unites bittersweet melodies, Nordic nostalgia and an intriguing expression in her beautiful and direct music. Katrine has been participating in numerous music projects throughout the years and is now an experienced performer, despite her age. After studying voice at Copenhagen’s Academy of Music, Katrine has been focusing on her own music, primarily as band leader, singer and composer for her eponymous project. She is currently working on what she hopes will become her debut album with the talented Swedish producer and musician Daniel Fridell. 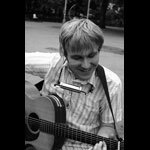 Frank Hoier is a songwriting performer (Guitar, Harmonica) who lives & plays in New York City. Influenced by american music (Folk, Blues, and Rock & Roll), original songs involve equal parts sarcasm, hope, desperation, humor, anger & love. His first year in NYC saw an Urban Folk magazine cover, and the front page of the arts section in Newsday. You might have seen him playing down in the subways of New York City with a studied repertoire of Beatles and Dylan. 9:30 - Cross-Pollination set ft KATRINE OTTOSEN & FRANK HOIER! !